Discussion in 'Suspension' started by csuviper, Mar 29, 2016. Starting this thread because i was doing some research that started from a FB post and i wanted to know the facts behind each. What is a control arm suspension? Free-er movement vs stock arms. Wider range of movement = increased travel. Helps to achieve alignment specs. They provide more caster because of the placement of the pivot point being moved upward. This helps you out because when you lift, you lose caster, without caster your truck will want to wander. Ball Joints are the same as what comes standard on the Tundra. Aftermarket are typically stronger and provide additional travel. Uniballs are really just a version of a heim joint. These ball joints are a direct replacement for the original joints that came with many of our Toyota and Nissan truck upper control arm sets. COMH which stands for Commercial series, low carbon steel. The body is 52100 Steel Heat Treated Hard Chrome Plated. The race is low carbon steel oil coated. WSSX-T series stands for Wide series, stainless steel, self lubricating. Our uniball UCAs are made from 1.5" DOM tubing and TIG welded. Energy suspension bushings, and only use 1" stainless FK bearings for the best corrosion resistance in all weather conditions. This is a work in progress. Stay tuned for more info. Stormtrooper81, trdprobped17, Sas and 12 others like this. Awesome right up Brian. Camburg had ball joint uca's also. Sefferston and TRON like this. Glad you made a write up on this. Explains it to the know-nothing's like myself lol. Great thread, I'll be following..
JBA is supposed to be developing some UCAs with OEM bushings, and grease-able, replaceable ball joints. Its still in the works. Really haven't fine tuned anything yet. Still missing the differences, why you need it, further list of companies and trimming the verbiage from the websites on each UCA description. 040Tundra, FirstGenTundra, Grey Wolf and 2 others like this. Stormtrooper81 and zcarpenter92 like this. before i got my tundra i had a great little tacoma that i installed a set of total chaos uca's on. a couple things i could say about them is that they were very time consuming to install but allowed me to correct my camber once aligned following a 3" lift. it doesn't hurt that they looked fantastic too. I'm an alignment and lift noob. I have a 3/1 level with front coilovers and rear shackles. I would like to install control arms as my caster is a little out of spec. 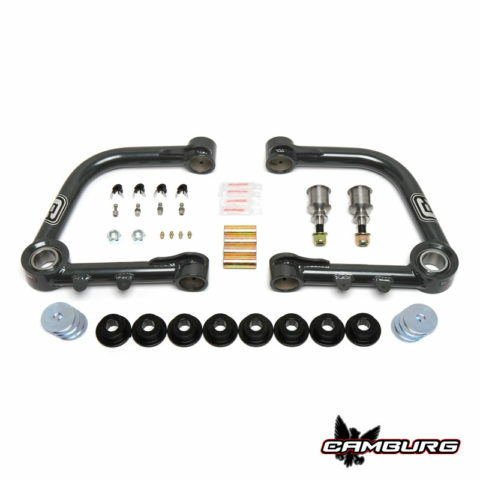 Will the SPC control arms provide the additional suspension travel that the TC UCAs advertise as well? Additionally, I have read that uniball UCAs require more frequent maintenance and wear out faster. Is that a rebuildable item on the TC UCAs? What kind of additional maintenance are we talking about? I want to pull the trigger on a pair today, but I'm trying to figure out what is best for me. The majority of my driving is on the street, but I do go offroad a reasonable amount. I would like to be well-equipped for desert driving on both hard and occasionally soft substrate..
Any help from some of the pros is appreciated! Yes, slightly less than the TC. Wash out often and I thought apply dry lube. Someone recently said TC doesn't recommend the dry lube but I thought they did. Yes if the ball wears out it can be pushed out and replaced. It's held it by a retaining ring. You can replace with a standard 1" stainless uniball from FK Bearings or pay the premium from TC. $80-$180 for replacement pair. Jus got edgemicated wow!!! I will look further into n get me a pair thanks Brian!!!! Good write up Brian, not sure how I didn't see this earlier. I'm thinking about the SPC UCA's also. I just want something with low maintaince. I really needed something like this. I'm thinking on the ToyTec 3/1 leveling kit. I have stock UCA's, will I need new UCA's in order to get an alignment after the 3/1? You won't absolutely need them, but I think at 3" it's a really good idea. It's hard to get an in spec alignment without aftermarket UCAs on a 3" lift. Added some more info to what you already had. We should keep this list updated, very useful. csuviper [OP] and YotaDan like this. Since I need an alignment, I figured I might as well order UCA's and get that outta the way but I've read a few times that people have been having trouble aligning with Camburg's. Is there a reason why? Are people having problems with TC and Icon's? I'm leaning towards these over the TC and tubular Icon's due to price, durability and size of the balljoints. Awesome man. I will update the OP. I have the 3/1 Toytec Boss lift with TC UCAs. Did not have any trouble with alignment. Same lift, no UCAs and honestly no issue with wandering at highway speeds...I must be lucky. Alignment at factory numbers no, but all in the green. Total Chaos arms: Full tubular design, Grease-able zerks for the poly bushings, 1'' stainless steel uniball. Great flow and durable control arm, but they will require more maintenance. More aimed at the off road enthusiast. SPC: Factory style control arm, Factory style ball joint, made to be adjustable to insure your alignment is spot on. Grease-able ball joint is the only maintenance you will have to worry about with those. These arms are more for the Daily driver/weekend warrior style driver. Shoot us a call anytime if you have any questions! Noodle, PermaFrostTRD, YotaDan and 3 others like this.